As many of you may remember from last year’s inaugural event, this is the one time of year that we like to simply say “Thanks!” to the DL community for being the best on the internet. Others will claim to be the biggest or most comprehensive, but no one comes close to the millions of passionate, intelligent, and friendly crew of Android enthusiasts that hang out here on a daily and monthly basis. You are all truly the greatest, and make doing this job a joy each and every day. So yeah, this is Reader Appreciation Week, a 5-day bonanza of Android-related giveaways. 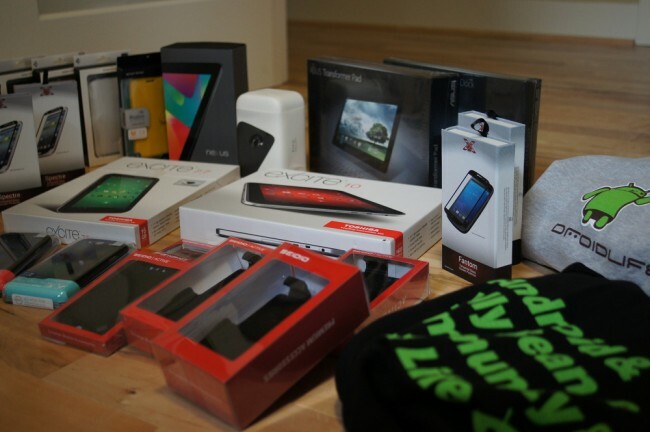 Last year, we handed out 3 tablets, a bunch of apps, some DL swag, Android collectibles, and a case here and there. It was a blast. But you know what? This is year 2, so we turned it up another notch. In fact, we turned it up a couple of notches. 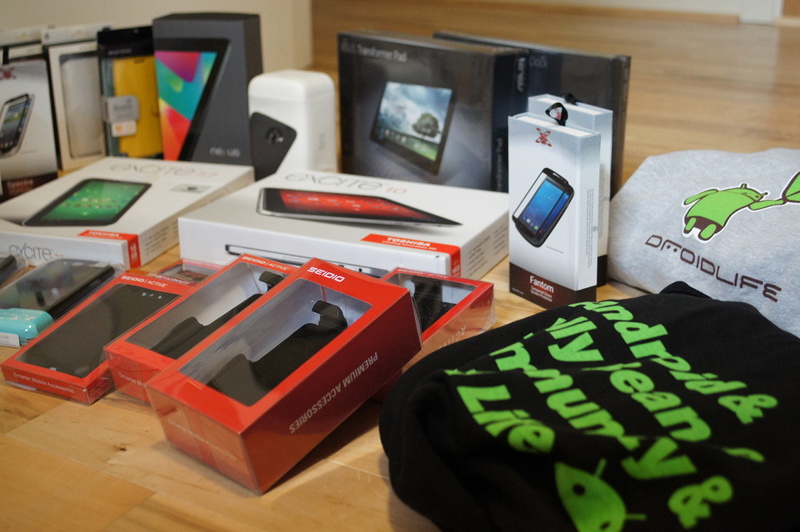 The Droid Life community has a chance to walk away with 5 different Tegra 3 powered devices (4 tablets and 1 phone) from NVIDIA, more cases from Spigen and Seidio than you can count, XGEAR tempered glass protectors, exclusive DL hoodies and t-shirts, and so much more. The photo above doesn’t even include it all and is more a less a sampling of the stuff sitting around my office. It’s going to be wild! Since we have 5-mega prizes (the tablets and phone), we’ll give one of them away each day in the signature giveaway of sorts. These will be full 24-hour contests so that everyone has a chance to enter. The rest of the stuff (cases, shirts, screen protectors, and apps) will be tossed out sporadically with short windows for entry. Since we have so many things to give away, it’ll be like rapid fire throughout much of the week. Basically what I’m saying is that you shouldn’t leave Droid Life for the next 5 days or you may miss out on a chance to win an amazing prize or two. We will also be tagging posts with [RAW] or #RAW so that you can pick out the Reader Appreciation Week coverage as it unfolds. Before we begin, we wanted to recognize the many sponsors that stepped up this year to make this the biggest 1-week giveaway you will find anywhere on the internet. Big thanks to the folks at NVIDIA (as always) for putting up five Tegra 3 devices and for being such a great Android player. Another big shout out to Spigen SGP and the countless cases and goodies they have provided to DL to giveaway over the last few months, to Seidio for the bundle of fun, and to XGEAR for re-doing their tempered glass protectors and allowing us to hand them out. Everyone ready? The first contest kicks off in about an hour!